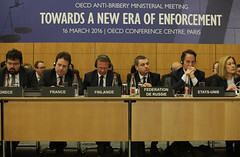 On 16 March 2016, the OECD hosted a Ministerial Meeting on the Anti-Bribery Convention at the OECD Conference Centre in Paris. Ministers from all 41 State Parties to the Anti-Bribery Convention and ministers from key partner countries participated, along with the heads of other international organisations and leaders from the private sector and civil society. The meeting was chaired by Andrea Orlando, Italian Minister of Justice. As well as providing support and vision to the future activities of the OECD Working Group on Bribery (WGB), this event provided an opportunity to recognise the many accomplishments of the first three phases of monitoring, to formally launch Phase 4 of the monitoring process and to encourage key non-signatory countries to adhere to the Convention and join the WGB.